Discover comfort, style and 4-star service at Detroit Marriott at the Renaissance Center. Ideally located on the famous RiverWalk in downtown Detroit, Michigan, our 70-floor hotel is just steps from the Cobo Center. Gaze out on downtown Detroit, the river and Canada through floor-to-ceiling windows in our spacious, well-appointed hotel rooms and suites. Stop by our hotel restaurant for a delicious breakfast, lunch or dinner, or fuel up for a day of Detroit sightseeing at our on-site Starbucks . Maintain your fitness routine in our modern fitness center. Elsewhere in the hotel, explore over 100,000 square feet of indoor and outdoor venues, including our convention center and three ballrooms. Host a cocktail party in our Wintergarden or on our outdoor patio overlooking the Detroit River. 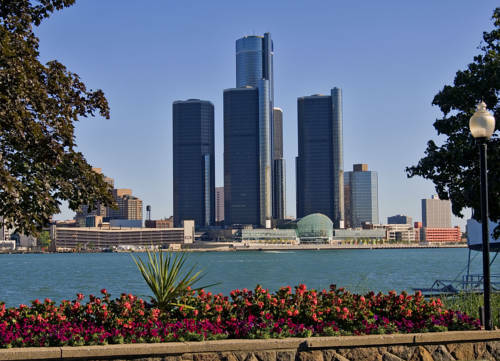 Our hotel positions you within walking distance to downtown Detroit attractions, as well as near the People Mover stop, located in our Renaissance Center. We know you'll enjoy your stay at our 4-star hotel in downtown Detroit. Motor City Pantry: Motor City Pantry located in the Hotel Lobby, available 24 hours 7 days a week, featuring food and beverages on-the-go, fresh local and national flavors and products. Ready to take to your room or enjoy in our active modern lobby. Volt: Enjoy excellence in urban contemporary dining at Volt, located in Downtown Detroit. Indulge in our breakfast buffet and stylish setting with floor-to-ceiling windows. Savor delicious American cuisine and regional craft beers in our RiverWalk restaurant. Fresh Bites - Our Fresh Take on In-Room Dining: Fresh Bites - our fresh take on in-room dining served 24/7. Fresh local flavor packaged to enjoy in your room or on the go. Pick up your order at the Motor City Pantry (Hotel Lobby, Level Three) or wait in your room and we'll deliver it. Starbucks : Stop by Starbucks on Level One of our downtown Detroit hotel on the international RiverWalk. Grab a quick cup of coffee to go, or settle in and use our complimentary Wi-Fi as you enjoy a leisurely lunch of sandwiches, pastries and delicious beverages.